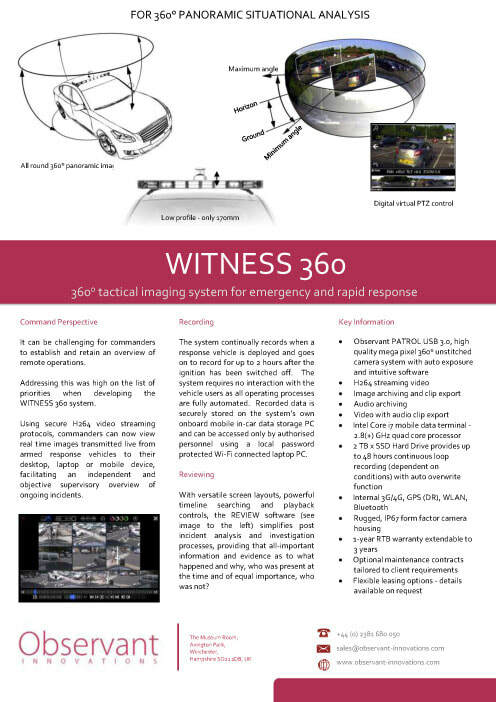 The WITNESS 360 system has been specifically developed with our partner ScenePro for use within Police Armed Response environs. The system enables the complete audio-visual documentation of all events that occur within the vicinity of police armed response vehicles. In a world cluttered with CCTV it is commonplace that vital information is not recorded. Often, CCTV cameras are pointing in the wrong direction or fail to provide a comprehensive account of events. The Independent Police Complaints Commission has highlighted that the capture of quality contextual and environmental information is key to ensuring that an accurate and thorough understanding of armed incidents can be established at an early stage. Improvements in quality, capability and the scope of evidence recorded at armed incidents remains a policing priority. WITNESS 360 addresses this issue. 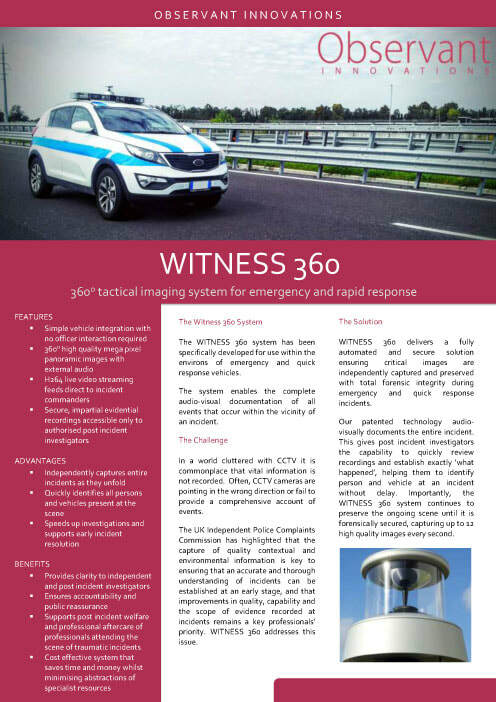 WITNESS 360 delivers a fully automated and secure solution ensuring critical images are independently captured and preserved with total forensic integrity during armed response incidents. Our patented technology audio-visually documents the entire incident. This gives post incident investigators the capability to quickly review recordings and establish exactly ‘what happened’, helping them to identify suspects, key witnesses and vehicles without delay. Importantly, the WITNESS 360 system continues to preserve the ongoing scene until it is forensically secured, capturing up to 12 high quality images every second.